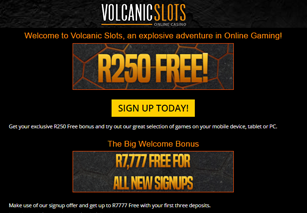 Volcanic Slots has been operating since 2016 and this new online casino has already proven to be extremely popular with South African players. Powered by the Habanero Gaming platform this site has been designed to work perfectly with mobile devices as well as tablets and pc's. All the games on offer have been created in HTML5, meaning that the player can expect a high quality gaming experience with quick loading times regardless of the device being used. This is a casino one could literally play from anywhere on just about any mobile device, tablet or pc. Players from South Africa can deposit, play and cash out completely in their own currency (ZAR). Volcanic Slots is operated by Volcanic Interactive Ltd and is licensed by the government of Curacao. Customer satisfaction and fair play are top priorities at Volcanic Slots. Furthermore all player information and transaction information is protected by the latest in SSL technologies, providing the player with a safe, fair and secure gaming experience. Volcanic Slots makes use of the Habanero Gaming platform which is known for offering high quality games with seamless play on just about any mobile device, tablet or PC through the website browser. This casino has over 65 unique slots on offer which provide a superb gaming experience sure to entertain even the most experienced player. There is also a very decent selection of table games on offer with varieties of Black Jack and Video Poker variations. New games are added almost every month so there is always something new to try at Volcanic Slots. There are three Random Jackpots which can be won by any slot player after any spin. There is no need to get a winning combination to win the Mini, Minor or Major Jackpot. Players can test Volcanic Slots out in fun mode by simply opening their webpage and loading any of the slots. No need to create an account in order to test them out. As all the games offered at Volcanic Slots are created in HTML5 they are completely compatible with any mobile device, tablet or PC that has a website browser. This site offers quick loading times and a high quality gaming experience for players using Apple, Android, Windows or Blackberry devices. The mobile interface is very light and uncluttered while being extremely easy to use. This design allows the players device to concentrate on the gaming experience and not waste any precious resources on a memory intensive website. Volcanic Slots is a truly unique site which does not offer its players on mobile devices a different or smaller selection of games than the players on PC. All the games are available for mobile and PC. Volcanic Slots is incredibly generous with their bonuses and promotions on offer. New players can enjoy an exclusive R250 Free No Deposit Required bonus by simply creating an account, verifying their email address and then selecting the R250 Free bonus with code PLAY250 from the available bonuses in the Bonuses section. There is also an incredible Sign Up Offer which provides the player with a R7777 free bonus on their first three deposits. Players can get a 100% match bonus up to R2777 with their first deposit, a 75% Match bonus up to R2500 with their second deposit and a 50% match bonus up to R2500 with their third deposit. There are also hefty bonuses on offer for each day of the week. Players can receive 50% up to R2500 on their first three deposits each Monday. Each Wednesday players at Volcanic Slots can claim three bonuses starting with a 50% bonus up to R2500 on their first deposit, followed by 60% bonus up to R3000 on their second deposit and then a 75% bonus up to R3750 on their third deposit. Thursdays are little Fridays at Volcanic Slots and players can start off their day with a 100% match bonus up to R5000 on their first deposit and follow that up with a 50% bonus up to R2500 on their second deposit. Each of these bonuses can be claimed every Thursday. Players from South Africa can deposit in ZAR using all the most popular methods such as VISA, MasterCard, Easy EFT, Skrill and regular bank wire (EFT) from their local banking account. When cashing out these players can use Skrill or bank wire (EFT) directly to their banking account. Cash outs are processed quickly and reliably each working day of the week and are paid out in ZAR. Players in other currencies have different methods on offer and these can be viewed in the sites cashier. Volcanic Slots is just the kind of casino that many players have been waiting for and can be highly recommended. Players can take advantage of the highly immersive gaming experience offered without having to wonder if their device is compatible. This reliable casino is sure to keep surprising us with their new innovations and great games. We would definitely recommend our players to take full advantage of the Free R250 No Deposit Bonus and experience a new take on online gambling.